At IGA Redland Bay, we are doubly fussy about our fresh offer. 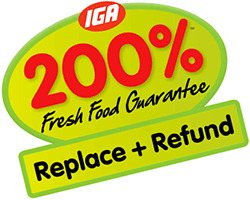 We even have a 200% guarantee to make sure you are happy with your IGA fresh purchase. Every time you see this stamp, it’s your assurance of our fresh food guarantee. Did you know that if you are not totally happy with your fresh purchase we will immediately replace the product free, plus refund the value? We have faith in our fresh products and are always confident that what we sell will be the best quality available. We guarantee it.